Order your own copy of the Legend of the Five Rings Core Rulebook at your local retailer or online through our website today! In the land of Rokugan, the Emerald Empire has lasted for a thousand years. 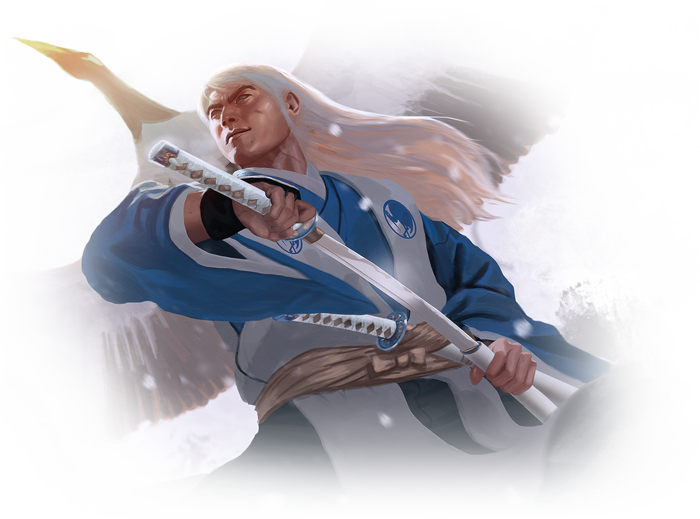 Under the guidance of the noble Hantei emperors, the samurai of the Great Clans have protected the lands from threats within and without, since the Kami came down from the heavens and established Rokugan as the most favored of kingdoms. As a samurai of the Emerald Empire, your duty lies in service to your lord, your clan, and your Emperor. Will you stay true to your duty, no matter what sacrifices it demands of you? Or will you hold true to your own code of honor, even to the point of death? 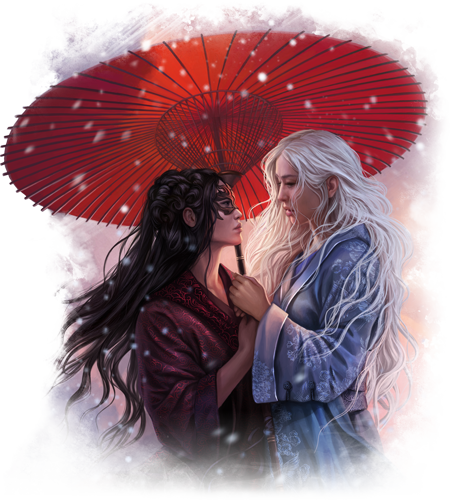 Fantasy Flight Games is proud to announce the Legend of the Five Rings Roleplaying Core Rulebook for the Legend of the Five Rings Roleplaying Game! 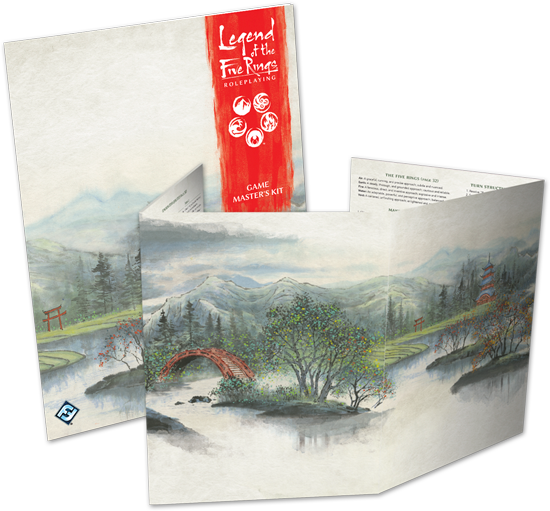 At 336 stunning, full-color pages, the Legend of the Five Rings Roleplaying Core Rulebook allows Game Masters and players alike to enter the world of Rokugan like never before. 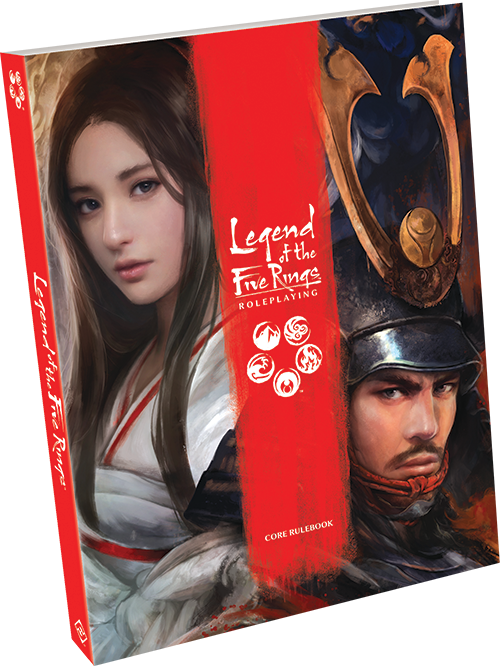 The Core Rulebook is the next step after the Legend of the Five Rings Roleplaying Beginner Game, and offers players new and deeper ways to customize their characters and craft their own adventures in the Emerald Empire. Be sure to check out the player resources for Legend of the Five Rings Roleplaying in the support section of our minisite, including blank campaign sheets, character sheets, the Game of Twenty Questions, and DLC content! 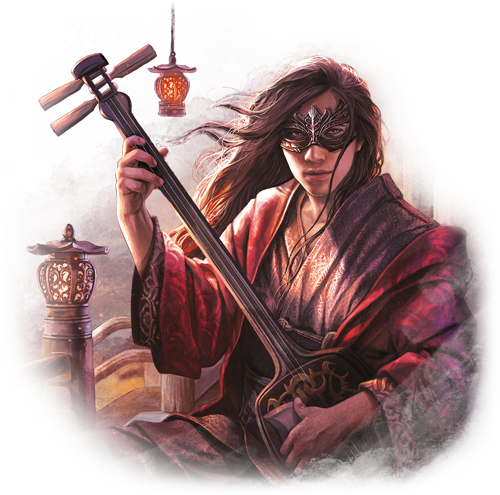 The first section of the Legend of the Five Rings Roleplaying Core Rulebook is dedicated to character creation, giving players the tools they need to craft their own samurai in the world of Rokugan. 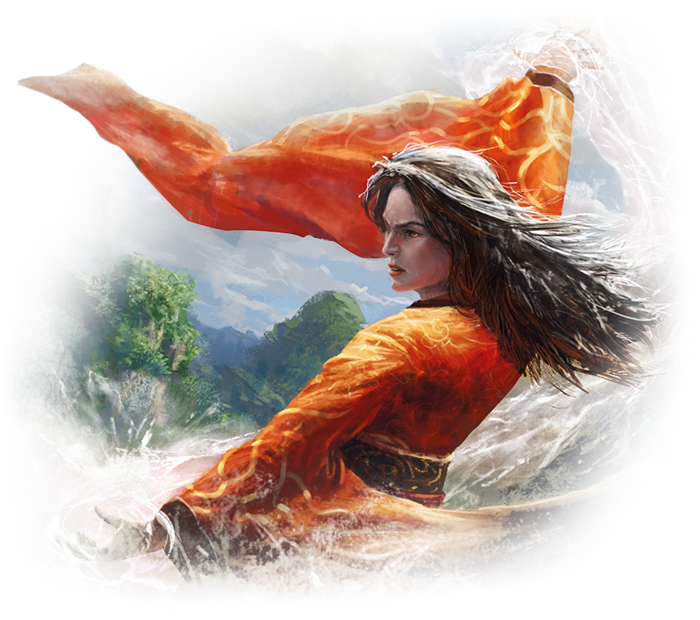 Rather than using pre-made characters, as in the Legend of the Five Rings Roleplaying Beginner Game, the Core Rulebook gives you everything you might want to invent your own characters, weaving yourself seamlessly into the Emerald Empire. Since the very first edition of the game in 1997, the Game of 20 Questions has helped Legend of the Five Rings players establish a complete and complex character in the world of Rokugan, and this process returns in the new version of the RPG. By working through twenty questions about your character that ask everything from your character’s clan alignment to their heritage, players are able to establish their characters both thematically and mechanically in a simple way. Answers to questions like “What is your character’s school, and what role does that school fall into?” will help determine your starting skills and their ranks, as well as having mechanical implications. Meanwhile, questions like “How should your character die?” have no mechanical purpose, but serve as a powerful impetus to flesh out your samurai and develop your story. In addition to the massive number of schools, advantages, and disadvantages included in the Game of 20 Questions, you'll find entire chapters devoted to the skills that you can hone and perfect as a samurai, alongside the kata, kihō, invocations, rituals, shūji, mahō, and ninjitsu techniques that you can master. Finally, a chapter on Equipment gives you everything that you need to equip your samurai with the weapons, armor, items, and other personal effects that he or she needs to thrive in Rokugan. Once your character is created, the world is yours to explore. The book contains several chapters designed for the benefit of the Game Master, featuring advice on running a game in the world of Rokugan, including different ways to run a campaign, as well as a wealth of mechanical rules and non-player characters that can be used to populate your world and bring it to life. While the Beginner Game contains the rules you need to roleplay in a pre-made adventure, the Core Rulebook provides a more in-depth explanation of these rules and lets you truly make the Emerald Empire your own. Furthermore, as your samurai grows throughout a campaign, the Core Rulebook's experience paths invite you to upgrade your samurai throughout their adventures in Rokugan, growing in experience and learning new skills and techniques. Launching alongside the Legend of the Five Rings Roleplaying Core Rulebook are two different products designed to enhance your roleplaying game experience! Legend of the Five Rings Roleplaying uses a set of custom dice to determine the success, failure, strife, and narrative opportunities generated by every test. (We'll take a much closer look at how you can use these dice in practice in future Legend of the Five Rings Roleplaying previews!) You can claim your own set of these dice with the Legend of the Five Rings Roleplaying Dice Pack—this pack contains ten custom dice, five black and five white. The Legend of the Five Rings Roleplaying Dice Pack will launch alongside the Core Rulebook in the third quarter of 2018. The dice are also available through our Legend of the Five Rings Dice App on Apple and the Google Play Store! 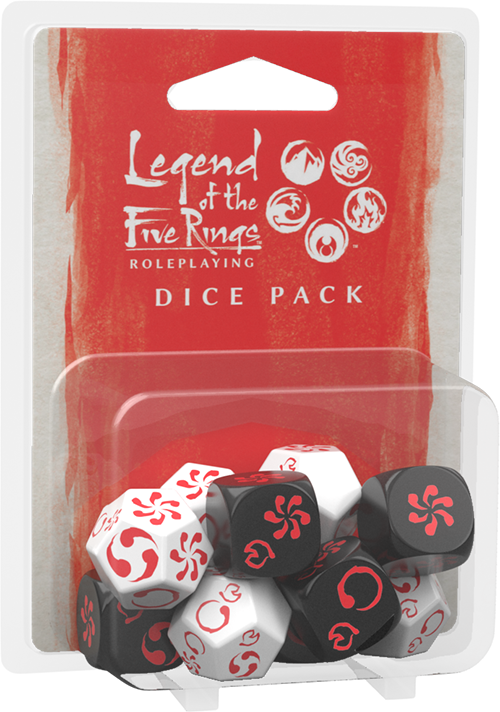 Launching alongside the Core Rulebook and the Dice Pack is an indispensable tool for Game Masters: the Legend of the Five Rings Roleplaying Game Master's Kit. The centerpiece of the Game Master's Kit is the GM screen. One side features beautiful art of the world of Rokugan, while the other side of the GM Screen is filled with rules reminders and tables. This allows the Game Master to keep notes and skill checks hidden if they desire, but also features helpful rule reminders and charts right at their fingertips—such as an index of commonly referenced rules, steps to making a check, examples of spending opportunity, and more. Every table, chart, and reminder also features the page in the Core Rulebook from which it is referenced, giving GMs a simple way to check a rule with an option for a more in-depth explanation. The Legend of the Five Rings Roleplaying Game Master's Kit also provides a perfect beginning adventure for players, inviting them to take their first steps into Rokugan. “Dark Tides” sends players to the mysterious and obscure town of Taimana Choryū, and the entire adventure is designed to challenge characters socially and emotionally, as well as with action and detective work. What secrets await in the Slow Tide Harbor? Keep the world of Rokugan at your fingertips with the Legend of the Five Rings Roleplaying Game Master's Kit and Dice Pack! The world of Rokugan is at your fingertips with the Legend of the Five Rings Roleplaying Game. Experience Rokugan with help from the Beginner Game, or choose to go all in with the Core Rulebook, Dice Pack, and Game Master's Kit! Become a samurai of Rokugan with the Legend of the Five Rings Roleplaying Core Rulebook (L5R02), the Legend of the Five Rings Roleplaying Dice Pack (L5R03), and the Legend of the Five Rings Roleplaying Game Master's Kit (L5R05), available now for pre-order from your local retailer or our website! Look for these products to release in the third quarter of 2018. In the Legend of the Five Rings Roleplaying Game, players take on the role of individual samurai whose honor and loyalty will be put to the test. These samurai serve their lords as warriors, courtiers, priests, or monks and embark on adventures filled with drama, suspense, humor, romance, and horror.